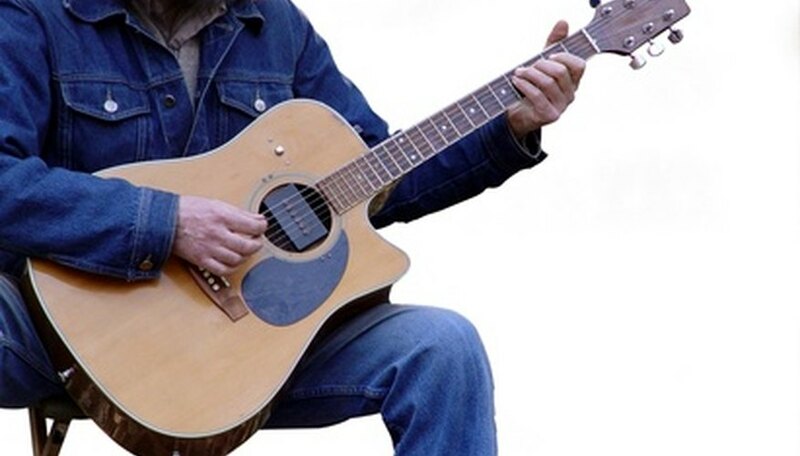 The standard tuning for a guitar is (high) E, B, G, D, A, and (low) E. While most songs are written to be played in standard tuning, sometimes musicians opt to tune their guitars up or down a half step in order to achieve a certain sound. Tuning one half step away from standard tuning allows guitarists to play the chords that they are used to rather than having to play everything up or down a half step, which can result in difficult chord formations and progressions. Tuning a half step is a simple and quick process. Turn on your electric guitar tuner and pluck your high E string. If your guitar is in tune, your tuner should show an E on its display. Tighten the tuning key until the pitch of the high E string reaches F if you want to tune up a half step. Loosen the tuning key until the pitch of the high E string reaches Eb/D# if you want to tune down a half step. Pluck the B string. Tighten the tuning key for the B string until it reaches C if you want to tune up a half step. Loosen the tuning key until the pitch of the B string reaches Bb/A# if you want to tune down a half step. Pluck the G string. Tighten the tuning key until the pitch of the G string reaches G#/Ab if you want to tune up a half step. Loosen the tuning key until the pitch of the G string reaches Gb/F# if you want to tune down a half step. Pluck the D string. Tighten the tuning key for the D string until it reaches D#/Eb if you want to tune up a half step. Loosen the tuning key until the pitch of the D string reaches Db/C# if you want to tune down a half step. Pluck the A string. Tighten the tuning key until the pitch of the A string reaches A#/Bb if you want to tune up a half step. Loosen the tuning key until the pitch of the A string reaches Ab/G# if you want to tune down a half step. Pluck the low E string. Tighten the tuning key until the pitch of the low E string reaches F if you want to tune up a half step. Loosen the tuning key until the pitch of the low E string reaches Eb/D# if you want to tune down a half step. How Do I Tune My Guitar to E Minor?